Written by Janet Choi on February 23, 2017 . If you’ve never connected the dots between customer acquisition and user onboarding, you might have a problem. Why? Let’s start with the first five minutes of a typical user experience. For SaaS products, “somewhere between 40 and 60 percent of people who start a free trial will never log into the software a second time,” according to SaaS expert Patrick MacKenzie. That means that “the first five minutes … is all a lot of people are ever going to see” of your product. Five minutes! That’s a small window of opportunity, which may explain why new users face a barrage of “guidance”—tooltips, tours, in-app messages, multiple “how are you doing?” check-ins, and kitchen-sink welcome emails. If your approach to user onboarding feels like you’re throwing a spaghetti of information at everyone new and praying that something sticks—take a step back and rewind back beyond those first five minutes. What do your customers experience as they cross the bridge from the point of acquistion to your product? Done right, marketing isn’t just a way to acquire another customer. It’s a way to preboard people to success in your product. According to user onboarding expert Samuel Hulick, there’s some heavy lifting you can do to prime users for success “long before that person signed up.” Preboarding involves “setting expectations and guiding their motivation and momentum in the right direction.” Build bridges, instead of roadblocks and speed bumps to progress, to carry them through onboarding and wins. Software has become incredibly competitive, and channels are noisier than ever. That’s why, according to 5x startup founder and CEO of Drift, David Cancel, if you can get close to and aligned with the customer, you’ll win. If you’re only focused on yourself, you’ll go out of business. Historically, companies visualized the process of becoming a customer as a funnel: a person becomes a prospect, then a lead, then a trial user, then a customer. 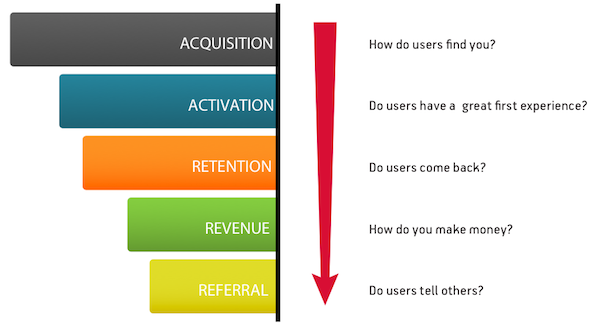 Models like Dave McClure’s pirate metrics visualize this journey as a series of sequential steps that starts with acquiring a person’s attention via marketing, then funnels a user towards the ultimate goal of paying you every month. Funnels split your organization according to function, not according to customer needs. Marketing teams pitch its audience marketing, sales teams pitch its prospects sales, and product teams pitch its trial users the product. Customers today often need help across functional lines to educate themselves, getting value alignment from marketing, advice from customer success on use cases, support for specific issues and engineers on integrations. Teams organize around driving revenue growth instead of around measurable customer success. A funnel points towards revenue generation. So marketing hands leads to sales, which hands signups to product, which hands customers to customer success, all in the service of making more money. What you end up seeing is that each team starts to optimize around revenue within their function, instead of helpfulness to the customer. Then, when it comes time to actually use the product, customers aren’t prepped to succeed. Funnel vision hems you into short-term thinking about quick conversions rather than taking a long-term view of meaningful growth. To MailChimp co-founder Ben Chestnut, the funnel looks like a meat grinder, crushing people at the top through to closing a sale, regardless of the collateral damage. This sacrifices long-term customer relationships for short-term revenue in your preboarding, trial and conversion flows. 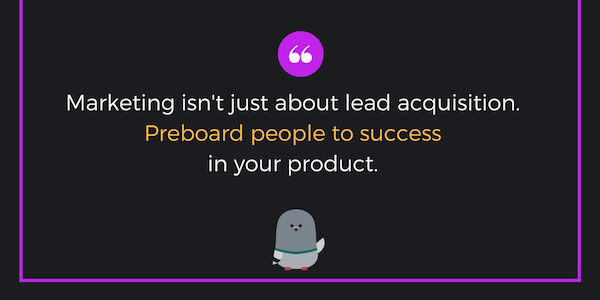 Fortunately, turning your marketing into a tool for preboarding and customer success is not a huge leap. It’s a simple realignment of priorities that keeps an eye towards customer success as part of your acquisition work. Customer success works closely with customers daily, solving adoption issues, adapting workflows, and finding ways to get an organization using and finding value in the product. Product teams and product marketers talk to customers regularly, understand their pain points, and know how product features help solve those pain points. By bringing this type of expertise into your marketing, you can create content that acquires customers and educates them with preboarding material. AdEspresso, which helps you optimize Facebook ads via A/B testing, does this well. They lean on its product team to generate proprietary data to yields insights on what makes a Facebook ad successful. Marketing then uses its expertise in story-telling to craft a narrative for customers that simultaneously attracts them to the blog and gives them fodder to succeed with the product. 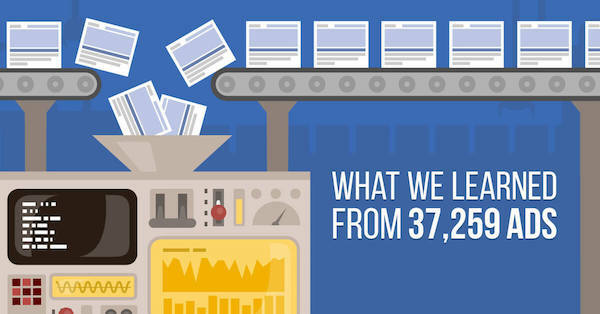 For example, AdEspresso did an analysis of 37,259 Facebook ads and pulled seven key insights on how to craft your Facebook ad. From a top-of-funnel perspective, the article drove nearly a thousand shares because, as a data-driven piece, it promised insights applicable to anyone interested in digital advertising. But it also included concrete tips alongside 15 examples of real ads in the wild, serving as inspiration for improving your own ad copy. One of the biggest roadblocks to running your first A/B test is coming up with a meaningful variation to test. AdEspresso also knows that nothing is more intimidating than a blank canvas and posts like this can also help their customers get going with their first campaigns. When it comes to social media, companies focus on collecting followers, likes, and mentions. They worry about projecting success and brand building. What they might lose sight of is the core value of social media—the ability to directly engage with and help individuals. Kissmetrics, which provides web analytics for marketers, is famous for its blog, but they actually started their marketing efforts on Twitter. Rather than set out with the goal of growing their follower count, they focused specifically on being helpful to their customer. They did this pre-blog, pre-content marketing machine, and even pre-product. They found that analytical marketers in their competitors’ ecosystem—companies like Google Analytics and Omniture—hung out on Twitter where they shared articles using #measure. The folks at Kissmetrics joined the conversation by curating articles on the topic and offering their expertise. Gotta hand it to the @KISSmetrics team for consistently pumping out good #measure links. Before they knew it, they built a reputation for being helpful with the exact customer segment that would succeed with their product. They did this without any focus on generating leads or producing revenue, as that part of the marketing machine didn’t exist yet. When they did turn on the acquisition machine, the customers they were bringing in were already aligned with the vision of KISSmetrics and understood why the product was so powerful—and were therefore less likely to churn and more likely to be successful. Minimal homepages were a major trend because they increased conversion rates. However, that sets up the danger of serving a company-centric conversion metric rather than indications of improved customer success. According to research from SaaS serial entrepreneur Hiten Shah, minimal homepages shift the user education that typically happens on a marketing site to the first-time user experience. Because users weren’t educated on the marketing site, they got confused during onboarding and had to backtrack to try to find information about features, pricing, and the company. Hiten’s study recorded the screens of 90 people for 1,800 minutes of video as they navigated different marketing sites, and he asked them to perform a series of tasks similar to what a user might do to understand a product before signing up. For instance, a former version of Buffer‘s minimal marketing site meant that users entered the onboarding flow much more quickly compared to users browsing other SaaS marketing sites. However, when users wanted to learn more about the Buffer for Business offering, they had to click out of the flow and back onto the marketing site. That’s in stark contrast to Campaign Monitor‘s marketing site, presented in the same study as an example of customer-centric design. 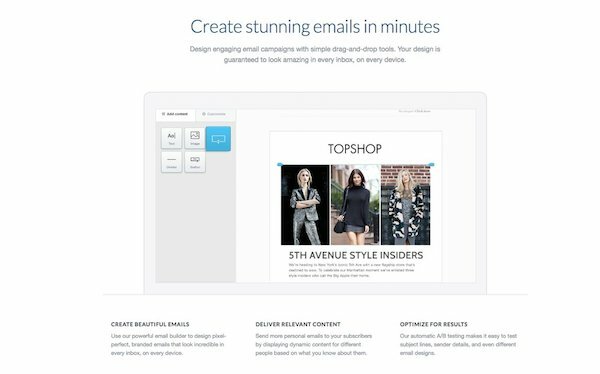 The homepage greeted visitors with a looping screencast of an email campaign being created, giving an immediate sense of what the product is like (visitors to Buffer’s page had to sign up for a free trial just to see the product). When asked if there was information they needed but couldn’t find, every user reported that there was not. What’s even better is how Campaign Monitor’s landing page got customers excited about using the product. “You see dynamic demos of exactly what you’re getting. I think it’s really well done. It’s very seamless…” one tester said. That’s the power of good marketing-as-preboarding. Short-term funnel thinking would lead you to believe that you were winning with a minimal page (more signups! ), while a broader perspective would show that you were just moving the problem from acquisition to onboarding. In the words of Mattermark CEO Danielle Morrill, “Customer engagement is the new marketing” which requires evaluating all marketing “activities in light of potential to drive towards customer success milestones” and “one critical end goal: putting the customer front and center.” A holistic focus on customer success ensures that marketing functions like a bridge, not a meat grinder. If there’s a disconnect between your marketing and helping your potential customers get to the value in your product and be successful, then your funnel vision is causing you to leave money on the table.